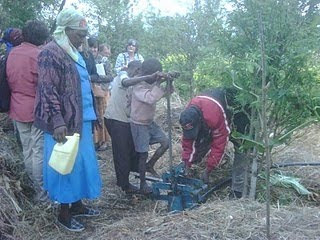 Ndeianiswa Kitomari (left foreground) and others pump water at her farm in Tanzania. Photo by Kate Merrill. Ndeianiswa Kitomari stands tall and silent. She has just arrived home from church on this Sunday, striking in a blue two-piece dress suit, purple sweater and floral head scarf. But few people know that her real name is Ndeianiswa. She known widely as "Mama Nana," a designation that announces she is the mother of eldest born Nama. She is the first matriarch met by my group of Tanzania Study Tour participants, 14 individuals from across the United States journeying around the city of Arusha, its countrysides and mountain slopes to learn more about the ways in which Heifer International partners with resource-poor people to help them lift themselves out of hunger and poverty. Mama Nana's husband is named Zadock. He speaks to us in Swahili explaining that he was loaned fish, training and then goats by Heifer several years ago as part of the Northeast Tanzania International Livestock Assistance Project. Since then he has become what our team called a "master farmer." Not only has the passed on the gift of animals to others in his community, but he is a model for other farmers and leads them in training to pass on the knowledge that he has gained as a result of his partnership with Heifer. His voice is steady but soft, and his eyes are averted out of what seems to be a sort of shyness and humility -- but the occasional laughter and smile indicate a kind heart. Mama Nana looks at him with pride as he explains the intricacies of cultivating a "kitchen garden," the patience of growing vanilla beans -- Mama Nana immediately brings us a photograph of him with the vanilla plant -- and the science behind mixing the perfect blend of compost and soil. Two hours later we walk to the four carefully constructed ponds where he farms tilapia fish, and he and son Nana roll up their pant legs and walk into the water with a large net spanning the pond's width, bringing up with it a dozen fish into its folds. How often do you gather the fish for personal cooking? he is asked. "Whenever Mama says," is the response. "Asante sana," I say to Mama, thanking her very much for welcoming us into her home, her garden and her world. She smiled and responded in kind -- sharing with me a bit of the brightness and life that I know must sustain her husband, her family and her land. Amy Carter is a research and communications specialist at Heifer International. This week she joins a study tour of Heifer projects in Tanzania. Read part two of her post here. 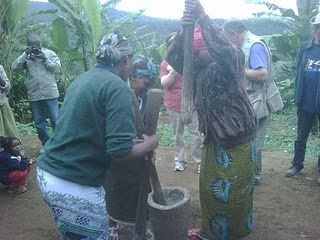 Women grind grain into meal at a Heifer project in Tanzania. Photo by Kate Merrill.